This week in New York City, the eyes of the racing world are fixed on the NASCAR Nextel Cup champion, Tony Stewart, and the other nine drivers who are in town for their series banquet after performing well enough to make the 2005 Chase for the Championship. (NASCAR Busch Series) along with ASA, ARTGO and all around Midwestern short track terror Ted Musgrave (NASCAR Craftsman Truck Series). Those two have had their career paths lead to the Busch Series and Craftsman Truck Series titles respectively this year, but haven’t forgotten about their regional roots. Most of the drivers have been here before. A few have not, including Miller who won the Southern Modified champion in the first year of NASCAR sanctioning of the series. The quiet Miller usually does his talking on the racetrack and has never been to New York City before for any reason. He’s been overwhelmed by the experience even though he’s been here for less than 24-hours. evening of wine tasting (well...maybe a little more than just tasting) and authentic Italian food. The champs had plenty of company. NASCAR Nextel Cup drivers Kyle Busch and Michael Waltrip dropped in along with several high ranking NASCAR Officials including Mike Helton, Jim Hunter, John Darby, George Pyne, Robin Pemberton and Don Hawk. Waltrip raced in the now-defunct NASCAR Dash Series before his Cup career got off the ground and he pointed out that things were much different when it came to regional tour banquets of 20 years ago. 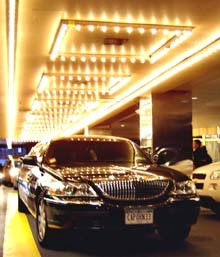 The champs are getting full VIP treatment, including limo rides from the airport. Wednesday was a day of logistics for the most part. 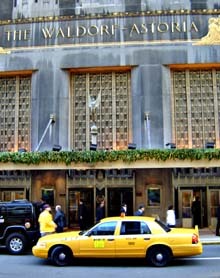 The drivers got into town, were whisked from the airport to the Waldorf Astoria Hotel in Manhattan, checked into their rooms and got a lay of the land. And getting there in a city of traffic was half the fun. Stewart is not alone in the Big Apple and it’s not just because he has a hoard of media members following him to capture every move he makes. The fact is, he is not the only NASCAR champion making a whirlwind tour of the America’s biggest city this week. The other group of 11 titlists might not make big headlines or have as many autograph seekers chase them down this week, but they are just as worthy to be there. They are the other NASCAR National champions of 2005, who are also in NY for the better part of the week. The NASCAR short track champions are represented by National Dodge Weekly Racing Series champion Peyton Sellers, Andy Santerre from Busch North, Mike Duncan from the West Series, Tony Hirschman from the Whelen Modified Tour, Junior Miller from the Whelen Southern Modified Tour, Jeff Fultz from the Southeast Series, Justin Diercks from the Midwest Series, Jim Pettit from the Southwest Series and Jeff Jefferson from the Northwest Series. Also along for the ride are two short track alums who have made it big – former Busch North standout Martin Truex, Jr.
Having the notable names stop by was a fact that was appreciated by the champions. The food and wine weren’t bad either. After the formal activities for the evening were complete, several drivers took impromptu van tours of the city and visited areas such as the Christmas Tree at Rockefeller Center, Times Square and Ground Zero. Thursday, things really get geared up with the first full day of activity. Speed51.com will be strutting right along with the champions for the rest of the week and will bring you all of the details. 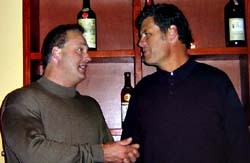 Jim Pettit (L) chats with Michael Waltrip (R) at dinner.